WASHINGTON (CNS) — At a Mass packed mostly with immigrants, Washington Auxiliary Bishop Mario E. Dorsonville tried to get the crowd to focus on the plight of the Holy Family. They had no home, he said. Many closed their doors to them when they were seeking shelter and running from persecution, he said. But he reminded them also of God’s promise. “We might be poor, but we’ll never be alone,” Bishop Dorsonville said to those in the pews, some who were likely facing similar situations. At a weekend Mass to mark the Dec. 12 feast of Our Lady of Guadalupe, he assured them that God and the Catholic Church would be with them “in these difficult moments.” Millions, he acknowledged, are waiting for relief in the form of immigration reform. But with a president-elect who made campaign promises to form “deportation forces” and remove 11 million immigrants, many are facing 2017 with trepidation. The landscape for immigrants in 2016 already had been a rough one. In June, the U.S. Supreme Court States deadlocked on a case dealing with plans by President Barack Obama to shield 4 million from deportation through executive action. Without being able to break the 4-4 tie, the high court essentially left in place an injunction blocking the immigration policy from being implemented. Various polls also reflected an increasing reluctance by some groups in the country to welcome immigrants from the Middle East. 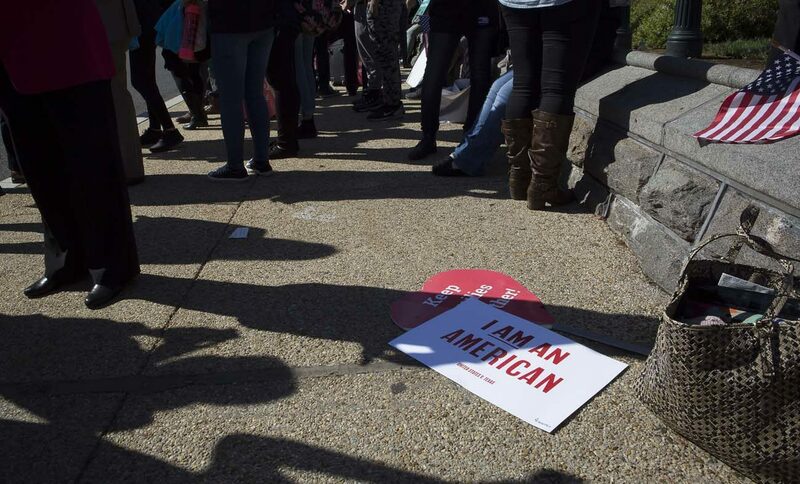 The Brookings/Public Religion Research Institute Immigration Survey, released in June, showed that while 58 percent of Americans surveyed opposed a temporary ban on Muslims from other countries entering the U.S., non-white Americans were the ones most opposed. Some say these views in part helped President-elect Donald Trump and his running mate, Mike Pence, win, since they were able to mobilize those who felt fears and concerns about immigrants from Latin America and Muslims. But just what will happen after Trump takes over the presidency in January remains a mystery. In a TV interview shortly after his election, he said he would deport 2 million to 3 million “people that are criminal and have criminal records” but didn’t mention the 11 million in the country without legal permission that he had originally quoted as deportation targets. He also removed his call for a “Muslim ban” from his website shortly after winning the presidency. In a recent Time magazine interview, after the publication chose him as “Person of the Year,” Trump said he is “going to work something out” on childhood arrivals, young people who were brought into the U.S. as children by their parents but have no legal documentation. Using executive action, Obama in 2012 created the Deferred Action for Childhood Arrivals, also known as DACA, which allows certain undocumented young people to have a work permit and be exempt from deportation. More than 720,000 have been approved for the program. In November 2014, Obama took executive action to expand DACA to allow more young people to benefit from its provisions. He also implemented a program for parents of citizen children — the Deferred Action for Parents of Americans and Lawful Permanent Residents program, or DAPA. Trump said he would end these policies. Some who meet the qualifications to apply for the DACA have not done so, fearful of what the new administration could do to them and those who already have enrolled. But in the December Time magazine interview, Trump said some of the youths were good students, some have wonderful jobs. The U.S. Catholic bishops have not directly spoken out against Trump and what he said while campaigning, but they have voiced their support for immigrants. They declared the feast of Our Lady of Guadalupe, a day of prayer with a focus on the plight of refugees and migrants. “To all those families separated and far from home in uncertain times, we join with you in a prayer for comfort and joy this Advent season,” said Cardinal Daniel N. DiNardo of Galveston-Houston, who is president of the U.S. Conference of Catholic Bishops, recognizing in a statement addressing the uncertain future many are fearing. Bishop Nicholas DiMarzio of Brooklyn, New York, addressed a letter to those “who at the present time find themselves in a miserable condition because of a change of the administration of our nation which has threatened many with deportation.” Walls are not solutions, he said, and deportations do not guarantee the country’s security. California Bishop Stephen E. Blaire of Stockton also called attention to similar fears and to racism. Racism, too, “has raised its ugly head in many communities,” Bishop Blaire continued. Alejandra Catalan, a parishioner at Our Lady Queen of the Americas in Washington, said she felt the support the Archdiocese of Washington and the church in general was trying to convey during Our Lady of Guadalupe. The reality for immigrants is difficult as Bishop Dorsonville pointed out, she said, but as she stood Dec. 10 with her husband, Francisco, and son Samuel at Washington’s Marian basilica, all dressed in indigenous clothing to honor the Virgin, she said she could only depend on one thing: faith.